Leaving aside Native Alaskans and Uniates, conversions to Orthodoxy in America were quite rare at the turn of the last century. Yes, American women occasionally converted when they married cradle Orthodox men, and there was the odd Episcopalian convert, but even taking those into consideration, conversions were very uncommon. And if Protestants joining the Orthodox Church were rare, a Jewish convert was rarer still. In fact, I’ve found only one solid example of a Jewish convert to Orthodoxy in America in the early years of our history. The priest, the convert and the male sponsor went behind the screen. The woman sponsor staid [sic] outside. The screen was not high and the congregation could some times see garments that were raised in the convert’s complete disrobing. They could hear the solemn words of the service by those within. They could hear the splashing and gurgling of the water as the convert was immersed for the first, second and third time. They saw the symbolical white robe and the cross as they were raised above his head. Meanwhile they joined in singing the hymn of baptism. 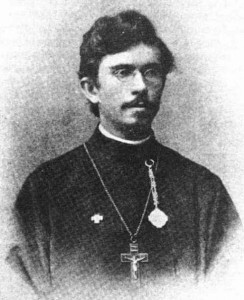 The ceremony coincided with the Feast of the Entrance of Christ into the Temple, and the officiating priest was St. Alexander Hotovitzky. Presumably, St. Alexander played a major role in bringing this young Jewish man to Christ. But how, exactly, did a young New York Jew come to join the Russian Orthodox Church in 1897, just two years after St. Nicholas parish was founded? What effect did this conversion have on his life? Was he unique, or were there other Jews who converted around the same time? It’s likely that a record of this baptism still survives, perhaps in the OCA archives, and it’s possible that the Vestnik, the official diocesan publication, may have mentioned the event, so information is out there to be found. In many ways, the conversion of a Jewish man to Orthodoxy in New York in 1897 is just as remarkable as the conversion of the black Jamaican Fr. Raphael Morgan a decade later. And, as with Morgan, this anecdote leaves us wondering about the rest of the story. Hopefully, one day, we will learn more. Perhaps “Vladimir” was originally a Russian Jew. Conversions from Judaism to Orthodox Christianity were not unknown in Russia. This might explain why the convert was received into the Russian Orthodox Church.